A Hermann grid illusion. Shape position and color contrast converge to produce the illusion of gray blobs at the intersections. A grid illusion is any kind of grid that deceives a person's vision. The two most common types of grid illusions are Hermann grid illusions and Scintillating grid illusions. Illusions such as these, and others, provide a window onto the way the eyes and the brain work together in creating perception. Scientists attempt to peer through this window when they propose hypotheses about how perception is accomplished. Illusions can also help us realize that our own perceptions may be limited or different from those of another person viewing the same thing. An example of the scintillating grid illusion. Dark dots seem to appear and disappear at intersections. The Hermann grid illusion was first reported by Ludimar Hermann in 1870, who discovered the illusion while reading John Tyndall's On Sound. In 1872, Ewald Hering observed that inverse colors (a black grid on a white background) produced similar results. Because of this, the Hermann grid is often referred to as the "Hermann-Hering" grid. The scintillating grid illusion is an optical illusion discovered by Elke Lingelbach in 1994, and is usually considered a variation of the Hermann grid illusion. Lingelbach and colleagues published their findings in a 1995 article entitled "The Hermann grid and the scintillation effect" (Perception 24, supplement, page 89). The Hermann grid illusion is created with a grid of black squares upon a white background. "Ghostlike" gray figures are perceived at the intersections of the white lines. These figures disappear when one looks directly at an intersection. The scintillating grid illusion is similar in construction. Instead of white bars, however, there are gray bars with white discs inserted at each intersection. 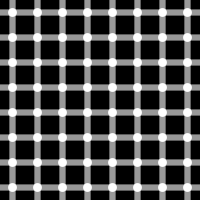 When viewers moves their eyes around the image, black dots seem to appear and disappear. The illusion is enhanced by eye movement, and decreased by moving too close or too far away from the image. A white-background version of the scintillating grid illusion. The effect of both optical illusions is commonly explained by a neural process called lateral inhibition. Retinal cells in the eye function as light receptors. If only a single receptor is illuminated, it perceives a larger amount of light than it does when neighboring receptors are also illuminated. The illumination of receptors inhibits the firing of nearby receptors, and the effect is transmitted laterally. In the case of the Hermann grid illusion, the setup of the white bands creates a situation where there is more light surrounding the intersections than there is along the bands between intersections. Thus the region of the intersection is more inhibited, and darker spots appear. The effect is greater when the grid is viewed peripherally, since lateral inhibition works over greater distances in peripheral vision. Scientists at MIT's Schiller Lab have disputed this widely accepted theory, proposing an alternate type of retinal functioning as an explanation for the illusion. Advocates of such alternative theories argue that the Hermann grid effect is not size dependent, works equally well with contrast reversal, and that there are misconceptions in the function of retinal cells that are assumed by the lateral inhibition theory. The proposed alternate theory, called the "S1 simple-cell theory," suggests that the illusion results from reactions within the cortex, not the retinal cells. 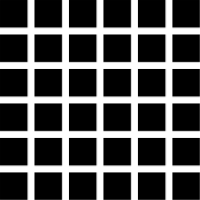 Both types of grid illusions, as well as related illusions, are excellent tools that help further the study of neuroscience. Scientists can use anomalies like perceptual illusions to try to understand more precisely the processes involved in vision and perception. ↑ "Hermann Grid" 1997. Illusion Works. Retrieved October 30, 2007. ↑ "The Neural Control of Vision" MIT. Retrieved October 30, 2007. This page was last modified on 17 July 2017, at 21:33.